AAHP has awarded this course 1 CEC (2017-00-096). The BLS has awarded this course .25 CM points (106-34436). This three module introductory level course provides an overview of laser safety for personnel in and around the working environment with enclosed high powered laser systems as well as low powered visible lasers. It is based upon the ANSI Z136.1-2014 Safe Use of Lasers Standard published by the American National Standards Institute (ANSI), along with relevant Federal (CDRH & OSHA) and State requirements. Introduction - A brief explanation of the course materials and the contents of the e-Learning modules. Module 1: Basics of Lasers and Laser Safety - Explains the basics of lasers, the nature of laser hazards, and the types of injuries that can be caused by lasers. Module 2: Laser Classifications and Safety Features - Explains laser hazard classifications and the safety features required for laser products. Module 3: Laser Safety in the Workplace - Explains laser safety in the workplace and laser safety programs. This course is available for site licensing in multiple languages. 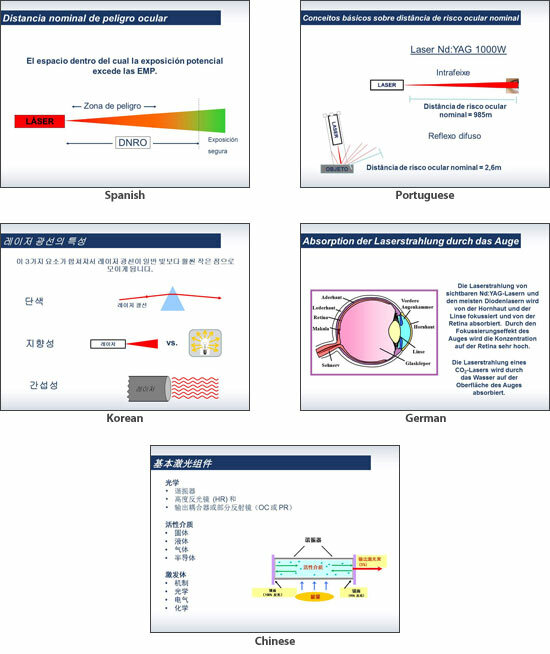 In addition to English, translations are available in Spanish, Portuguese, German, Korean and Chinese.